Unlaminated Business Cards: These cards are great for people looking for clear and effective business cards that still conveys quality! We only print on high quality 450gsm silk paper which provides a fantastic finish and maintains that professional image. 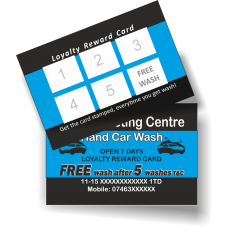 loyalty cards: Rewarding repeat orders is a great way of bringing customers back into store again and again. It builds brand loyalty and effectively helps grow your business. Our specially selected premium 350gsm uncoated stock can easily be stamped or written on, plus these cards quickly absorb ink to reduce the possibility of smudging. 85 x 55 mm Business Cards Single Sided, or Double Sided (Depending your order) 450gsm Silk.